Signal flags identified a vessel to other vessels like a license plate on an automobile. By the time of this photograph vessels were assigned letters which were published in shipping registers. Carrie Winslow's signal was JTQL. 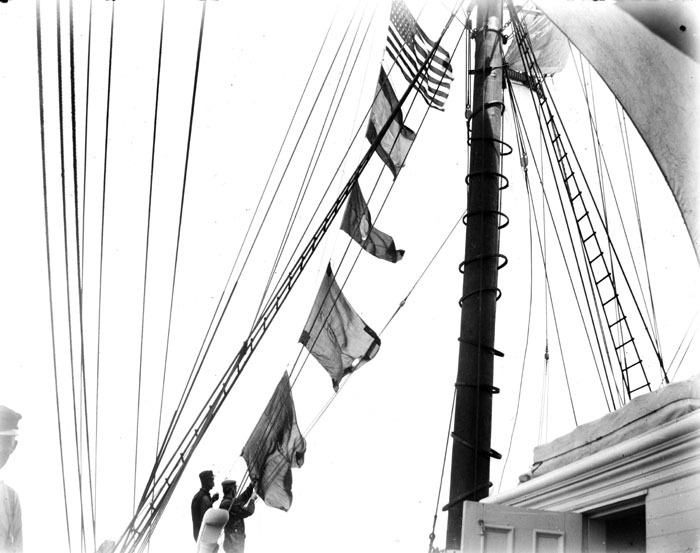 Here signal flags are hoisted to send a message to another vessel. 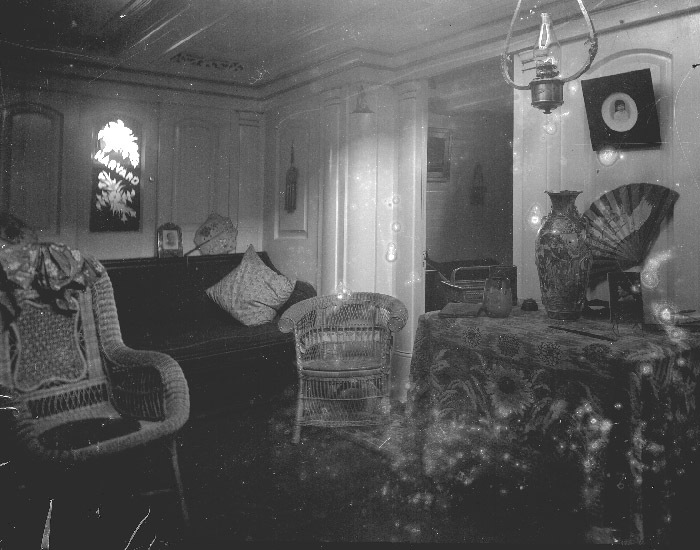 The photograph was taken by the captain's daughter , Ruth Montgomery in 1898, aboard the bark Carrie Winslow. Sailmaking and sail repair were regular work aboard a sailing vessel. Here, Capt. 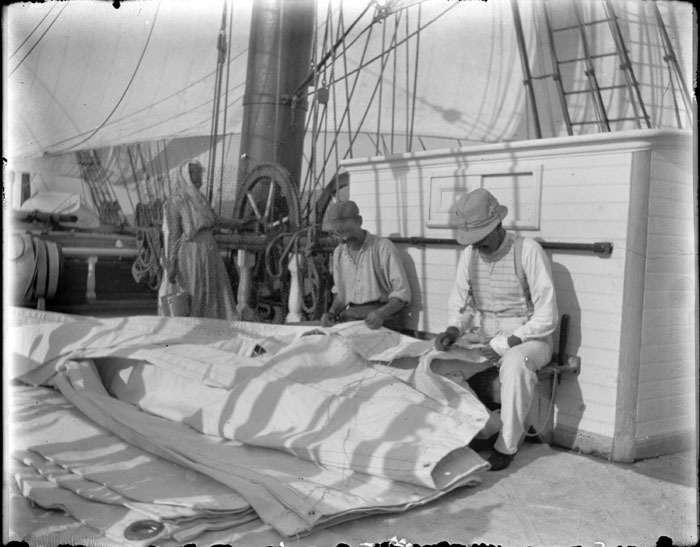 Montgomery is working with a crew member repairing a sail. The big round wheels near the mast belong to the ship's pump. The photograph was taken by the captain's daughter, Ruth Montgomery, aboard the bark Carrie Winslow in 1898. One of the crew members, Charles, steers the bark Carrie Winslow of Portland. The vessel typically carried lumber to Argentina and returned with a cargo of hides for making leather. The photograph was taken by the captain's daughter, Ruth Montgomery in 1898. 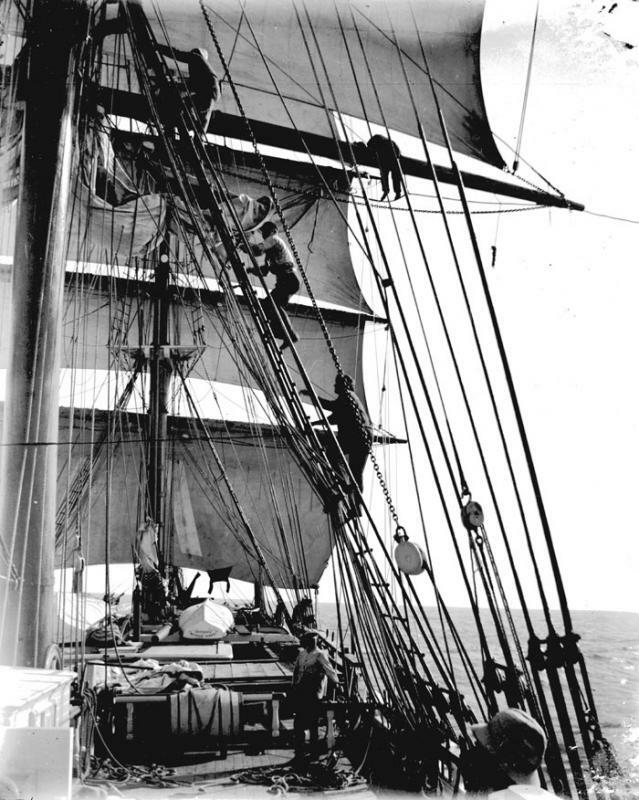 The crew climbs the rigging, going up the ratlines, as they bring up a new topsail to be "bent on" or attached to the yard. 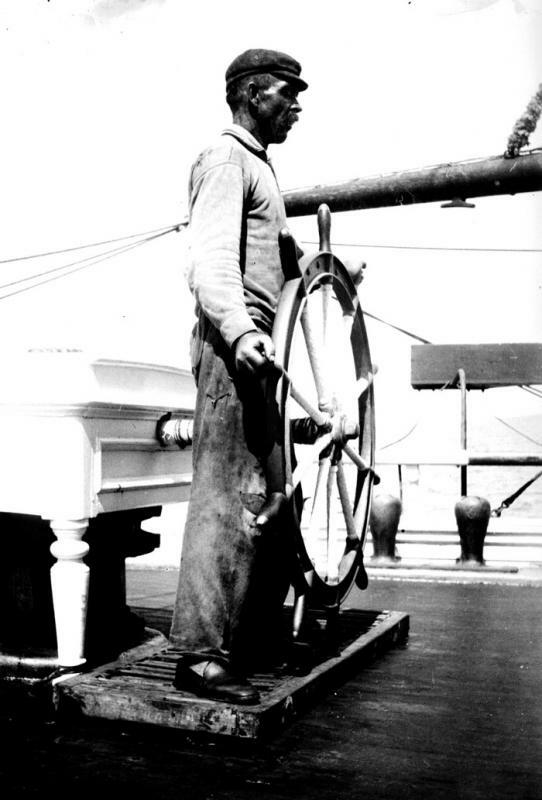 The photograph was taken by the captain's daughter, Ruth Montgomery, aboard the bark Carrie Winslow in 1898. Capt. Lincoln Alden Colcord's cabin on board the Boston owned bark Harvard. The woodwork was a product of her Newburyport builders, while the rattan furniture and other items were bought in China. At sea, much of this would be put away. Cabin interiors were built by special carpenters called joiners who often set up the paneling in a shop ashore. This photograph was taken in 1894 when the ship was in port by Capt. Colcord's brother-in-law, Frederick Sweetser. A bark has three or more masts with all but the after most mast square-rigged. The aft mast is fore-and-aft rigged. 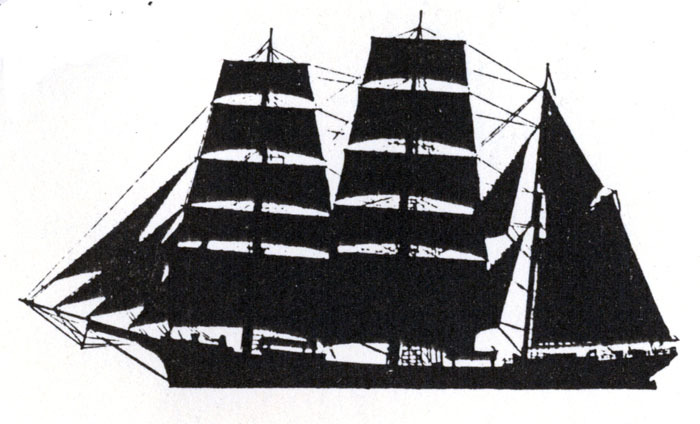 The diagram is from the Nova Scotia Musuem Informational poster, Sailing Ship Rigs. Every good day at sea includes taking a sun sight at noon, to find the vessel's latitude. With a good chronometer, one can also find one's longitude. Here Capt. 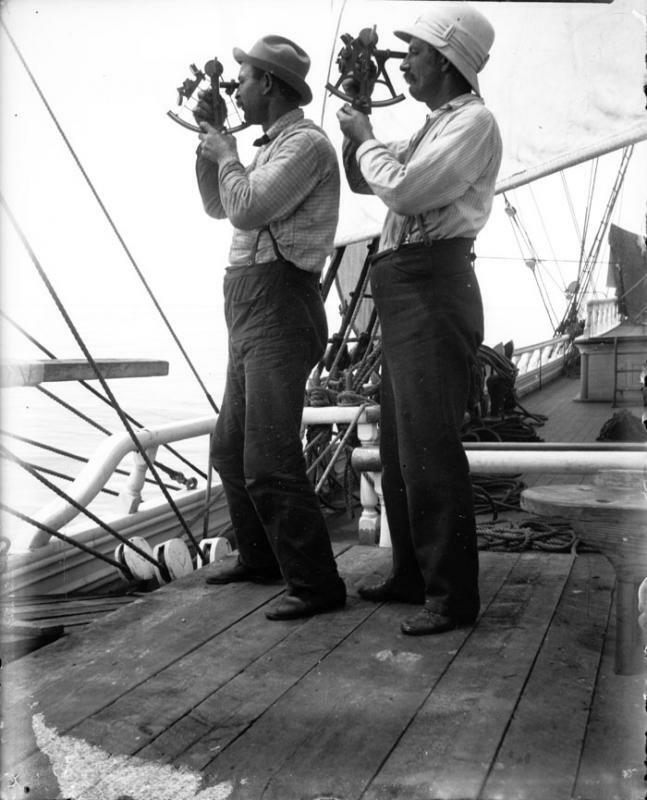 Adelbert Montgomery and the First Mate are "shooting the sun" or getting the sun's altitude using a sextant. The photograph was taken by the captain's daughter, Ruth Montgomery aboard the Portland owned bark Carrie Winslow in 1898. 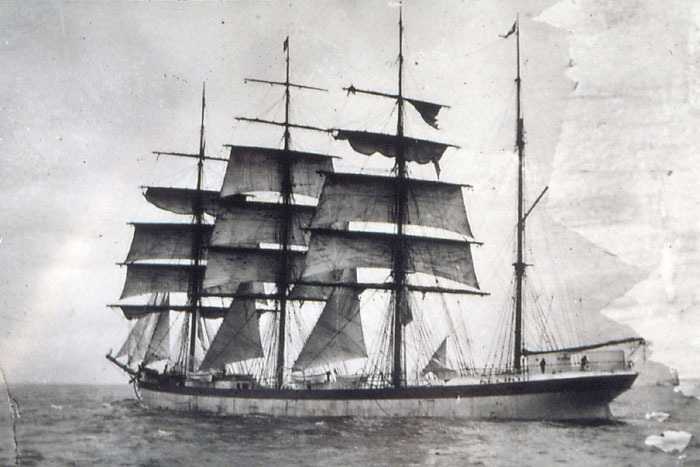 Launched in February, 1894, the four-masted ship Dirigo was the first steel square-rigged ship built in Maine, and the first steel ship built in the United States. Designed by a British designer, it was built at the Sewall Shipyard in Bath, using imported steel plates and shipbuilding labor. She was a typical British design of the 1890s. Eight more steel vessels were to follow. Dirigo is the Maine State motto, meaning "I lead" in Latin.